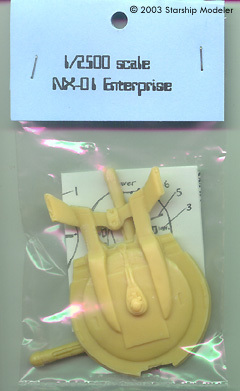 Even though Enterprise hasn't really connected with viewers, the Enterprise NX-01 has been (mostly) a hit with modelers. This kit is the second 1/2500 offering released this year. Inside the baggie are three nicely-cast resin parts, a small sheet of decals and a hand-drawn decal placement guide. The resin pieces are well done, with no pits, bubbles or other defects visible on my sample and only a little flash. There are three pieces: hull, and two warp nacelles. Detail is crisp and clean throughout - the warp nacelles are pretty impressive, actually. There are some rough surfaces - if you tilit the main piece just right in the light you can see the saucer's surface isn't completely smooth and uniform. Some careful sanding sould take care of that quickly - I'd prime the hull in a light grey or silver to make any irregularities stand out, then wet sand it with 400 - 600 grit sandpaper. There is no assembly guide, not that one is really needed - though it would be nice if a diagram of exactly where the engine attaches to the pylon, and which way the details face, had been included. 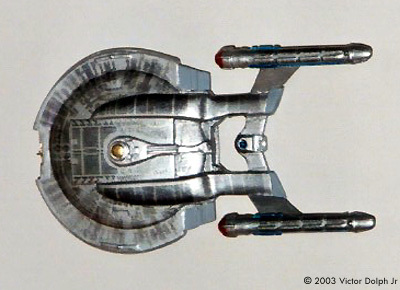 There are enough images of the "real" ship available that figuring out where the nacelles go should not be impossible. Decals are now ALPs-printed by JTGraphics. A slip of paper included that shows where each decal should be placed is included, and appears sufficient for the purpose. Is it accurate? It certainly looks the part. 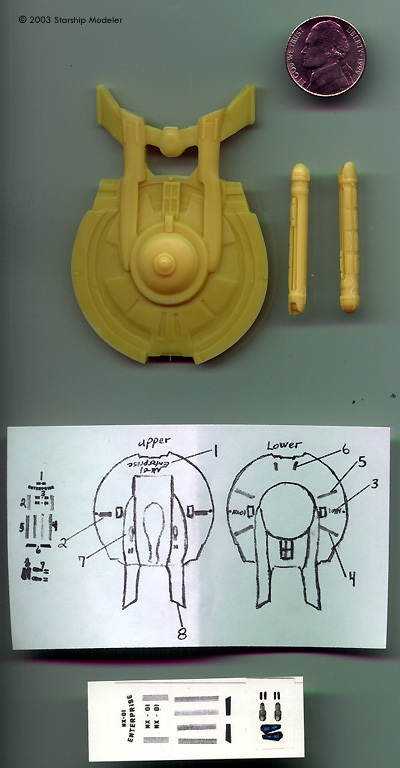 Compared to the Sci-Clone IN-EX kit, there are some significant differences in the details, especially on the underside of the saucer. Unlike the IN-EX kit, this one doesn't have any scribed deflector gridlines. However, at this scale, that's not a problem but more a matter of personal taste. Perhaps the biggest difference between the two kits is the size - the IN-EX is a good 20% smaller all around than this one. This kit should build up into a decent replica of the newest starship Enterprise. 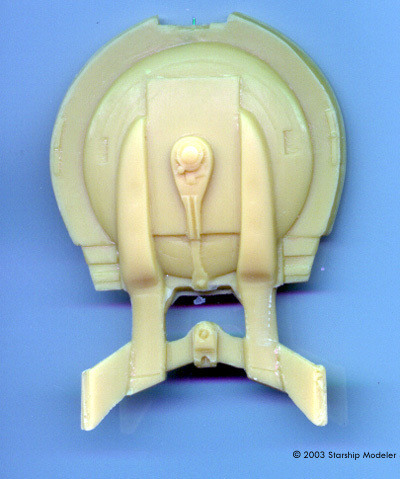 The clean casting and sharp detail make it emminently suited for someone's first resin kit. You can buy this kit directly from the manufacturer (please eMail for details) or from Federation Models. Many thanks to Victor Dolph for providing the review sample. Manufacturers and retailers, interested in getting your wares reviewed and publicized on a site averaging 3500+ readers a day? Contact us! This page copyright © 2002 Starship Modeler. First Published 3 July 2003. Last updated on 21 August 2003.